Today, immigrants and their supporters from East to West are sitting down in civil disobedience to shut down Immigration and Customs Enforcement operations. Nine immigrants and supporters in the Washington, D.C. area are shutting down the ICE Washington Field Office. ICE Enforcement and Removal Operations at the Washington Field Office is responsible for processing the detention and deportation of immigrants within Virginia and Washington, D.C. 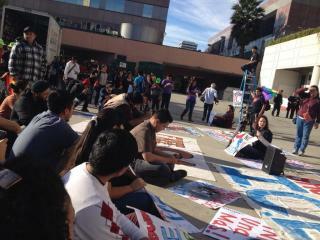 In Los Angeles, families are rallying outside federal buildings and the Los Angeles police department. Nine protesters were arrested in Washington, D.C. by Federal Protective Services and were released later that day. 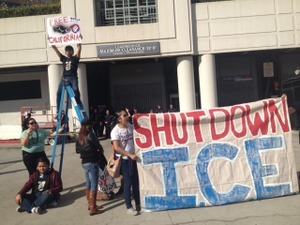 At the Los Angeles demonstration, police made five arrests after immigrants and supporters used rope and ladders to block the entrance and exit to an ICE facility. The protests are the latest in more than a dozen dramatic direct actions in the past two months organized by the National Day Laborer Organizing Network and other organizations in cities across the country where participants have used their bodies to block deportations. They point toward the White House's self-imposed deportation quota of 400,000 removals per year and the criminalization programs that conscript local police into efforts to meet it, such as the Secure Communities program, as areas under the president's exclusive authority. Protester Rosa Lozano of D.C. said "The House might have closed for the year but ICE will be deporting families on Christmas unless we stop it. Blaming Republicans can't stop the suffering in immigrant communities. But the president can. With the stroke of a pen he could end his deportation quota and expand relief like he did for dreamers." Blanca Hernandez, one of the protesters chaining herself to the ICE office that morning, said, "I have DACA [Deferred Action for Childhood Arrivals], but people in my family and so many other people in my community are excluded. It’s only fair for everybody to have the same opportunity because we all came here searching for the same thing." Yari Osorio, an immigrant rights organizer and activist from New York City, traveled to D.C. to attend the protest. Osiorio was born in Cali, Colombia, and grew up undocumented. He explained, "I feel it is important for us to not sit on our hands waiting for congress to pass CIR while the president continues to needlessly tear families apart. 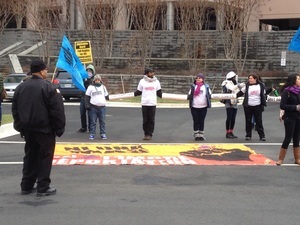 Obama has the power to stop deportations and we can't stop fighting until he does so." As Congress closes for 2013 without passing an immigration reform bill, the Obama administration continues deporting people at a rate of approximately 1,100 people per day. While Congress is on break, approximately 27,500 people will be deported. The Obama administration’s hypocrisy in relying on tens of millions of immigrant votes, but deporting and separating families at record rates, shows the true nature of the Democratic Party. The president maintains that he has full legal authority to conduct war on Syria and drone strikes without congressional approval. But when it comes to providing relief from the terror of immigration detention and deportation, he claims that his hands are tied. This is a lie. As the immigration debate winds on without result in Congress, more and more have expanded their search for relief from deportations to include the White House, who granted it to Dream-eligible youth last year and most recently expanded it to include military families. More than 500 organizations were joined this month by 30 Congresspeople in calling on the president to expand such relief from deportations to the fullest amount possible. The president and the Department of Homeland Security have authority to decide whether or not to deport. With the stroke of a pen, President Obama could order a moratorium on deportations until a just reform package passes. The Democratic Party uses the power of the presidency when it is in the interest of Wall Street and the Pentagon, but refuses to grant immigrants relief from deportation. Immigrant families around the country are fighting back. Families facing deportation have taken to the streets, stopping ICE in #Not1More deportation actions around the country.